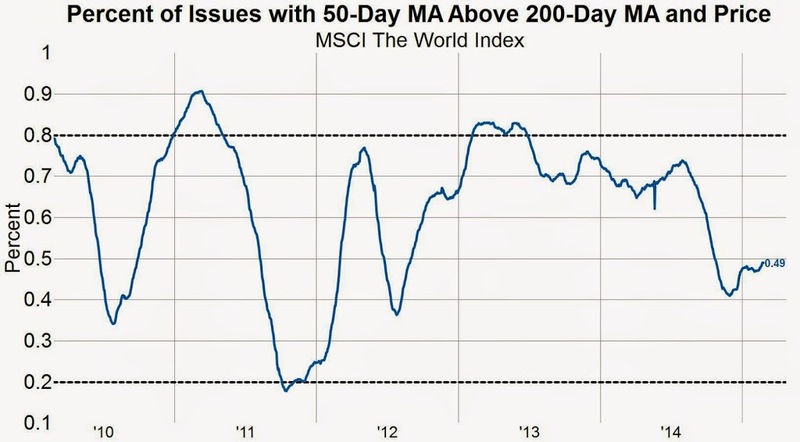 It’s gone somewhat under the radar that the MSCI World Index is now sitting at a new all-time high. That is usually a good sign for the market, especially when accompanied by improving market breadth. A hallmark of this bull market has been the utter lack of market breadth confirming new cycle highs, but this time is different, and we wanted to point that out. 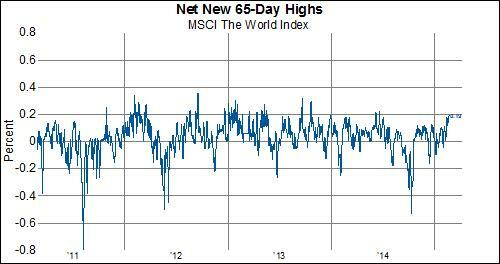 Chart two below shows the net percent of new 65-day highs for individual stocks in the MSCI World Index. The current reading of 19% is calculated by counting the number of stocks making new 65-day highs minus the number of stocks making new 65-day lows all divided by the number of stocks in the index. 19% is the highest reading since mid-2014, and importantly comes after a period of consolidation. 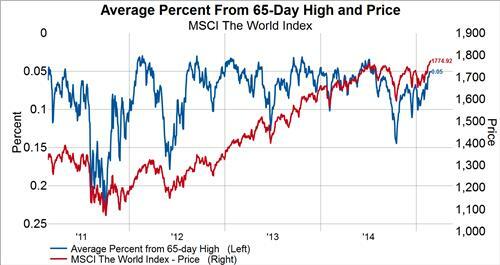 The third chart below compares the average stock’s percent from it’s 65-day high to the price level of the index. Here the lower the level of the blue line (left axis, inverted) the more participation of individual stocks in this latest new cycle high. The last chart below shows a very simple momentum indicator measuring the percent of stocks whose 50-day moving average is higher than the 200-day moving average. This indicator bottomed out late last year and has been improving ever since, though it is still at a rather low level. All this is not to say we are on the precipice of another 20% pop in stocks. The below could very well be a head fake setting up the next pullback. But, it’s worth pointing out the confirmation of market breadth indicators if for no other reason than the occurrence of confirming indicators has been so rare during this bull market.